often times some of the best homemade wedding invitation ideas and DIY inspiration can come from seeing other DIY wedding projects and invites from brides who have "been there and done that". We love it when our readers share their crafty creations with us! And we love to share it with you! Our gallery of reader submitted invitations is a great place to gain inspiration and tips from real brides. Below you can view the gallery of handmade invitations or you can even submit your own wedding invitation ideas, and add your own page of tips, ideas, or an invitation tutorial. Enjoy! Add Your Homemade Wedding Invitations? We'd love for you to add your own ideas and tutorials to our gallery! By filling in the forms below you can add your very own page to Do-it-yourself-invitations.com! Well, first and foremost, we want to check out your creative prowess! We want to see everything from the most simple of handmade invitations, to your most creative and unique ideas! Pictures! Yes, we love loads of pictures! Make sure they are clear, though. If they look too dark or are taken from too far away, it is hard for our readers to gain much inspiration. Tell us about products and supplies you used. This is so super helpful to others who are new to taking on creative projects like these. Pricing breakdown. Don't you just love it when you see just how affordable an invitation suite really is when the cost is broken down! When you plan ahead you really can save a boat load! All about sizing. A common question from our readers. People like to know exactly what size to cut papers and other pieces, envelopes, etc. Fonts! What is that fantastic font and where did you find it? The more you divulge when you share your homemade wedding invitations the better! Please do not copy and paste a page you built elsewhere. It's OK if you posted your invites somewhere else, but please write brand new, original ideas, comments, and tutorials on your page here at D.I.Y.I. At least one picture must be included. But we whole heartedly encourage many more! Can I add a link to my blog/website? Yes! Absolutely! But please do not make a page purely for advertisement purposes. It MUST be inspiring to other DIYers. Did you make your own invitations for your wedding or bridal shower? Have some tips or a tutorial you might want to share? 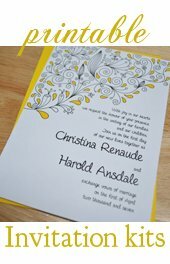 Share your diy wedding invitation ideas by building your very own page on Do-it-yourself-invitations.com! Do you have a picture to add? Great! It's highly recommended! Click the button and find it on your computer. Then select it. Got more than one picture? You can add it with html image tags or respond to our auto-responder email with your pictures attached. We'll host and add your pictures to the page for you!